There were eight Union regiments raised in North Carolina, four white and four of African descent. The two mounted infantry units were raised in the Western Region of the state, and all other units were raised in the east. In addition to the eight Federal regiments, there were partisan units, such as Bryson's Company, that recruited soldiers from both North Carolina and Tennessee. While the American Civil War was contested from 1861 to 1865, seven of the eight Union units were formed from 1863 to 1865. 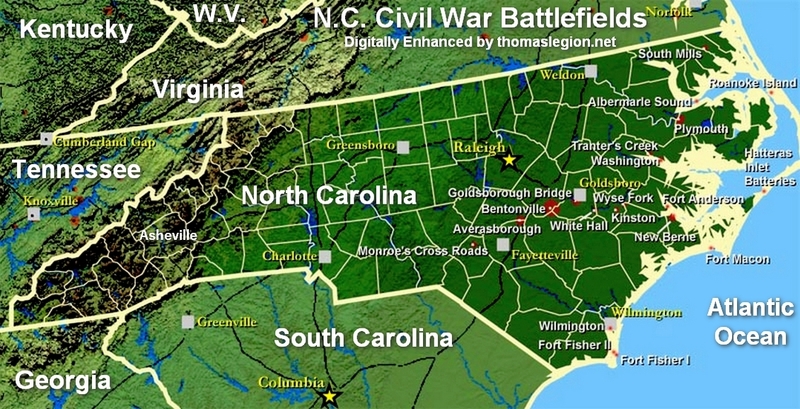 Since the majority of these units served and fought in North Carolina, which gave credence to the Brothers War, a battlefield map has been included for reference. Books sometimes have addendums and supplements, but the internet allows us to bookmark this page for future updates. ORGANIZATION. Organized at New Berne and Morehead City, N.C., March, 1864. Attached to District of New Berne, N.C., Dept. Virginia and North Carolina, to February, 1865. District of New Berne, N.C., Dept. of North Carolina, to March, 1865. SERVICE. Garrison duty at New Berne, N.C., and other points in District and Dept. of North Carolina, until March, 1865. Designation of Regiment changed to 14th U.S. Colored Heavy Artillery, March 17, 1865. ORGANIZATION. Authorized by Gen. Burnside May, 1862. Organized June 27, 1862. Attached to Dept. of North Carolina, Unassigned, to December, 1862. Unattached, 18th Army Corps, Dept, of North Carolina, to January, 1863. Unattached, 5th Division, 18th Army Corps, to July, 1863. District of the Pamlico, Dept. Virginia and North Carolina, to April, 1864. Sub-District Beaufort, N.C., Dept. Virginia and North Carolina, to January, 1865. Sub-District, Beaufort, N.C., Dept. North Carolina, to June, 1865. SERVICE. Attack on Washington, N.C., September 6, 1862. Operations at and about Shiloh September 17-20. Attack on Plymouth, N.C., December 10 (Co. "C"). Expedition from New Berne to Swan Quarters March 1, 1863 (Co. "G"). Fairfield March 3. Swan Quarter March 4. Winfield March 23. Siege of Washington March 30-April 20 (Co. "B"). Rodman Point March 30. Nixonton April 6 (Co. "D"). Raid from New Berne on Wilmington & Weldon Railroad July 3-7. Expedition from New Berne to Tarboro and Rocky Mount July 18-24. Tarboro and Sparta July 20. Street's Ferry July 21. Scupperton July 22. Reconnaissance on Greenville Road November 10. Near Greenville November 25 and December 30. Evacuation of Washington, N.C., April 26, 1864. At New Berne, Beaufort and Morehead City until July, 1865. Advance on Kinston and Goldsboro March 1-21 (Co. "L"). Battle of Wyse ForksMarch 8-10. Kinston March 14. Occupation of Goldsboro March 21. Mustered out June 27, 1865. ORGANIZATION. Organized at New Berne, N.C., and Portsmouth, Va., June 30, 1863. Attached to Wild's African Brigade, U.S. Forces, Folly Island, S.C., 10th Army Corps, Dept. of the South, to December, 1863. 3rd Brigade, Vodge's Division, Folly Island, S.C., to February, 1864. SERVICE. Transferred from Dept. of Virginia and North Carolina to Folly Island, S.C., July 29-August 9. Operations on Folly and Morris Islands against Fort Sumter and Charleston, S.C., until February, 1864. Moved to Jacksonville, Fla., February 13-16. (A detachment at New Berne, N. C, and participated in raid on Wilmington & Weldon Railroad July 3-7, 1863. Ford's Mill near New Berne October 30. Near Greenville November 25 and December 30.) (A detachment at Portsmouth, Va., and participated in Expedition from Portsmouth to South Mills, Camden, etc., December 5-24, 1863.) Designation of Regiment Changed to 35th U.S. Colored Troops February 8, 1864. ORGANIZATION. Organized at New Berne, N.C., November, 1863, Attached to District of New Berne, N.C., Dept. of Virginia and North Carolina, to April, 1864. Sub-District of Beaufort, N.C., Dept. Virginia and North Carolina, to February, 1865. SERVICE. Duty in the Defenses of New Berne, N.C., until April, 1864. Scout from Rocky Run toward Trenton December 21-24, 1863. Windsor January 30, 1864 (Detachment). Demonstration on New Berne January 28-February 10. Batchelor's Creek February 1 (Co. "F"). Bogue Island Block House April 2 (Detachment). Siege of Plymouth, N.C., April 17-20 (2 Cos.). Surrender of Plymouth, N.C., April 20 (2 Cos.). At New Berne and in the Sub-District of the Albemarle until April, 1864, and at Beaufort and Morehead City until February, 1865. Consolidated with 1st North Carolina Infantry February 27, 1865. ORGANIZATION. Organized at Knoxville, Tenn., October, 1863. Attached to 1st Brigade, Willcox's Division, 9th Army Corps, Left Wing Forces, Dept. Ohio, to April, 1864. 1st Brigade, 4th Division, 23rd Army Corps, Dept. Ohio, to February, 1865. 1st Brigade, 4th Division, District of East Tennessee, Dept. of the Cumberland, to August, 1865. SERVICE. Ordered to Greenville, Tenn., October 16, 1863, and duty there until November 6. Moved to Bull's Gap November 6, and duty there until December. March across Clinch Mountains to Clinch River. Action at Walker's Ford December 2. Gibson's and Wyerman's, Miss., February 22, 1864. Duty at Cumberland Gap and patrol duty in East Tennessee until April, 1865. Scout from Cumberland Gap January 23-27, 1865. Expedition from East Tennessee into Western North Carolina March 21-April 25, 1865. Moved to Boone, N.C., April 6, and to Asheville, N.C., April 27-30. Duty in North Carolina and East Tennessee until August. Mustered out August 16, 1865. ORGANIZATION. Organized at Portsmouth, Va., October 28, 1863. Attached to Wild's African Brigade, U.S. Forces, Norfolk and Portsmouth, Dept. Virginia and North Carolina, to February, 1864. SERVICE. A Detachment, with African Brigade, to Folly Island, S.C., 10th Army Corps, Dept. of the South, July 29-August 9, 1863, and in operations on Morris Island and Folly Island against Fort Sumter and Charleston until December, 1863. A Detachment at New Berne, N.C., and participated in scout from Rocky Run toward Trenton, N.C., December 21-24, 1863. Regiment on Expedition from Norfolk, Va., to South Mills, Camden, etc., N.C., December 5-24, 1863. Designation of Regiment changed to 36th United States Colored Troops February 8, 1864. ORGANIZATION. Organized at Knoxville, Tenn., June, 1864. Attached to 2nd Brigade, 4th Division, 23rd Army Corps, Dept. of Ohio, to February, 1865. 2nd Brigade, 4th Division, District East Tennessee, Dept. of the Cumberland, August, 1865. SERVICE. Scout and patrol duty about Knoxville, Tenn., and in East Tennessee until December, 1864. Scout from Morristown, Tenn., into North Carolina June 13-July 15, 1864. Camp Vance June 28. Russellville, Tenn., October 28. Big Pigeon River November 5-6. Moved to Paint Rock December 7. Expedition into Western North Carolina March 21-April 25, 1865. Moved to Boone, N.C., April 6, and to Asheville, N.C., April 27-30. Duty in North Carolina and East Tennessee until August, 1865. Mustered out August 8, 1865. ORGANIZATION. Organized at Norfolk, Va., January 30, 1864. Attached to District of Norfolk and Portsmouth, Va., Dept. of Virginia and North Carolina, to February, 1864. SERVICE. A Detachment transferred with African Brigade from Dept. of Virginia and North Carolina to Folly Island, S.C., 10th Army Corps, Dept. of the South, July 29-August 9, 1863, and engaged in operations on Folly and Morris Islands against Fort Sumter and Charleston, S.C., until December, 1863. Designation of Regiment changed 37th United States Colored Troops February 8, 1864.